Gretchen Rubin is right. Good habits can be surprisingly fragile. Even if you’ve been doing something for weeks, months, or years, you can get off track surprisingly quickly. You can be derailed by a vacation, by someone else’s vacation, by an illness, by someone else’s illness . . . you get the idea. I think I was surprised by not only how quickly good habits can evaporate, but how they can snowball. For example, one late night can turn into one missed workout which can turn into a tired person making less than stellar eating decisions and then staying up too late again because you are already off the wagon so why not also have that second glass of wine anyway and so on and so forth. We had visitors last week. Between spending time with them and trying to soak up free babysitting, I had a few late nights. I had more wine than usual. Before I knew it, I was at the end of the week with only one workout done, very little written, and feeling mighty cranky and rundown. I made deliberate choices to do certain things differently because of the guests. Nobody made me. I was still taken aback by how quickly things came off the wheels. And then the wheels fell off a cliff. And then burst into flame. 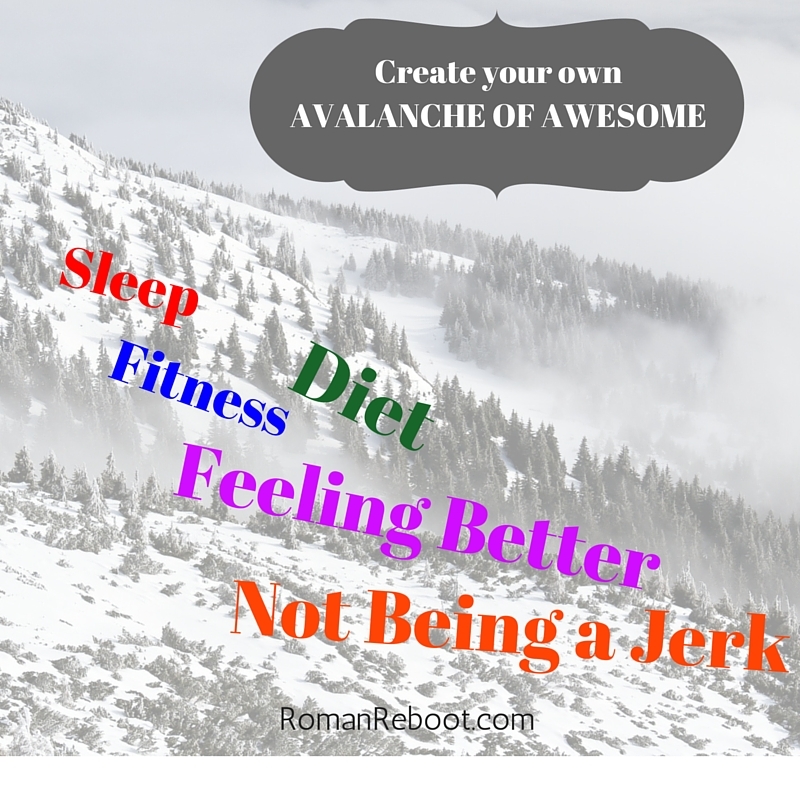 The good news is that you can also get back into what I like to call an Avalanche of Awesome by focusing on getting even one habit back on track. If I go to bed earlier and drink less, I sleep better. If I sleep better, I have energy to work out. If I work out and am feeling better, I make better eating decisions. If I do that, I feel better and am more likely to write and just be an all around more pleasant human being. It is all reinforcing. So that’s what I’m doing at the moment. Working on rebuilding one habit at a time to get back to an avalanche of awesome. At least until more guests arrive next week.